← Easter is Over, What Happens to the Baby Chick in the Basket? The month of April is my favorite month of the year because it happens to be dedicated to my favorite food: the grilled cheese! 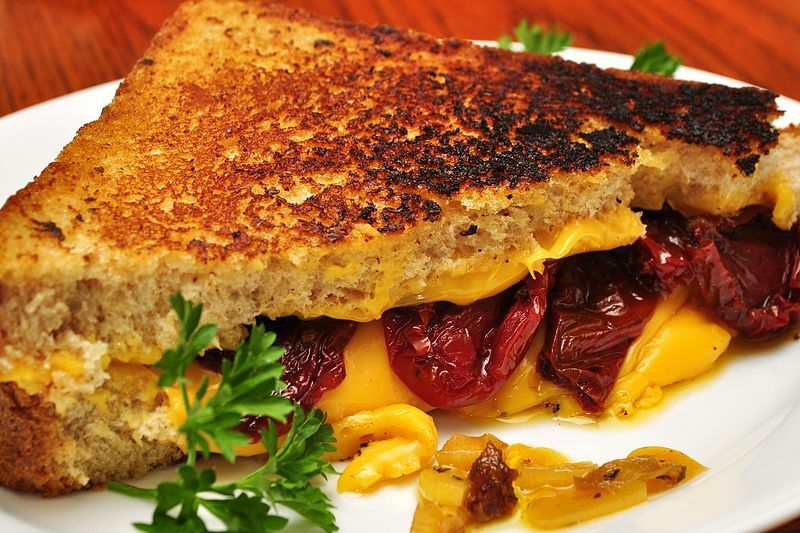 A grilled cheese sandwich is the perfect lunch or dinner, and can be customized for any taste. I usually create my own take on the classic with two pieces of buttered white bread, some cheddar cheese, tomato slices, and fresh basil, but there are tons of other ways to make this classic sandwich your own. Try mixing and matching different cheeses, spices and herbs, veggies, meats, and sauces to create your perfect grilled cheese! These recipes don’t include exact measurements because everybody likes a different amount of stuff on their grilled cheese. If you like yours stuffed with ingredients, feel free to add as much as you want! If you like to taste more grilled bread than anything else, don’t use as much of each ingredient. All of these should be buttered with unsalted butter, and cooked over a medium heat. They can either be grilled in a skillet, or on a Panini press. The Classic: Butter the outside of two pieces of white bread with unsalted butter, add your favorite cheddar cheese, and grill! Grilled Ham & Cheese: Butter the outside of two pieces of white or wheat bread, add your favorite cheddar cheese and some slices of deli ham, and grill! Tomato Basil Grilled Cheese: Butter the outside of two pieces of white or wheat bread, add a piece of either white American, mozzarella, or provolone cheese, add a few slices of tomato, sprinkle fresh basil pieces over tomato, add another cheese slice over the top of tomatoes and basil (you can mix and match the cheeses!) add other piece of bread on top and grill! Pepperoni Pizza Grilled Cheese: Butter the outside of two pieces of French bread, add mozzarella cheese (either slices or shredded), add pepperonis on top of the cheese, add marinara sauce, a sprinkle of oregano, then more mozzarella over that. Place that second piece of bread over all the ingredients, and grill! Hawaiian Grilled Cheese: Butter the outside of two pieces of your favorite bread, add a piece of white American cheese, add cut up pineapple (slices can be any size you want!) and Canadian bacon cut into small pieces, lay another piece of white American cheese over that, add top slice of bread, grill! Buffalo Chicken Grilled Cheese: In a bowl mix shredded chicken and buffalo sauce, butter two slices of French bread, lay one piece of bread butter side down in a warm skillet, add shredded mild cheddar cheese, then the buffalo chicken, then mozzarella cheese. Top with the other piece of bread and grill! Mac N’ Cheese Grilled Cheese: Make your favorite macaroni and cheese (preferably a creamy homemade mac n’ cheese), butter two slices of French bread, add mild cheddar cheese slices, add spoonful’s of mac n’ cheese, top that with more mild cheddar, add your other bread slice, and grill! Bacon Tomato Grilled Cheese: Cook up some bacon, butter two slices of your favorite bread, add a slice or two of mild cheddar cheese, add slices of tomato, add bacon pieces, add a couple of slices of white American cheese, top with other bread slice, and grill! Jalapeno Popper Grilled Cheese: Butter two slices of French bread, spread cream cheese on the inside of one piece, and lay mild cheddar slices down as the bed for your jalapenos. Add slices up jalapenos on top of the cheddar, and top with the piece of bread that was spread with cream cheese. Grill! Avocado and Spinach Grilled Cheese: Butter two slices of whole grain bread, spread your favorite pesto sauce on the other sides of the bread, add a slice of mozzarella cheese, add spinach and then add avocado slices, add one more slice of mozzarella, top with other piece of bread, and grill it up! Celebrate grilled cheese month with us at Fill Your Plate by commenting with your favorite grilled cheese recipe, or your favorite recipe out of the ones provided here! If you make any of these grilled cheese sandwiches, make sure to post them on our Facebook page and use the hashtag #GrilledCheeseMonth! For more tasty recipes, visit us over at www.fillyourplate.org! This entry was posted in Cooking, Food, In the Kitchen, Recipes and tagged Bread, Cheese, food, grill, Grilled cheese, Sandwich. Bookmark the permalink.